Imagine this: two women are working together in a Baghdad hospital. War breaks out and over time, each would join the millions of Iraqis fleeing their home to seek safe haven. Eleven years pass since their last meeting and one of the women is being introduced to her new neighbours at the Eltham Project. She discovers that among them is her long lost friend from Baghdad. This is Hanna and Khani’s story*. Hanna lived with her mother and brother in Baghdad where she worked as an accountant. Life for Hanna was good until her mother passed away and then in 2003, the war began. Hanna moved to Mosul (Northern Iraq) in 2006 and then to Jordan in 2014. She was accepted by Australia’s Humanitarian program and moved into the Eltham Project in August 2017. Khani also lived in Baghdad where she worked as an Accountant Manager for a hospital. After the war had continued for many years, Khani’s brothers left for Erbil [Northern Iraq] and Khani had to leave her home because the area had become too unsafe. Khani then lived at the hospital where she worked until that too became intolerable. Fortunately, Khani received a Refugee Visa and came to Australia in February 2017. At first she lived in Dallas with her two brothers and their families, but when they had to move to a new rental property, Khani had to find new accommodation and was referred to the Eltham Project. Khani agrees that the most difficult thing is the language. Both are learning English at Melbourne Polytechnic and each has a volunteer who visits weekly to help them to practise their English. Despite the language barriers, they are settling well at the Eltham units. Both have qualified to remain as permanent residents when the units convert to affordable housing for the elderly. And while they are thrilled to have the security and safety of a permanent home, they share their sadness of what they have lost. ‘We feel that we are sad to lose everything,’ says Khani. Both have lost their homes. Hanna shows me photos on her phone of her house in Baghdad – or rather what was left of it after war had reduced the rooms to rubble. She also points to the single precious keepsake that survived the journey from Iraq to Australia: a framed photograph of her mother and father. In Iraq it is customary for unmarried women to stay close to their extended families. In many cases, fathers and brothers would find a home for them nearby. Every Sunday, the extended families would get together, attend church and share lunch. Now, Hanna and Khani’s family are spread across the globe: Hanna’s brothers are in Sydney, the USA, Canada and New Zealand. Her two sisters remain in Baghdad. Khani has siblings, nieces and nephews throughout Melbourne, Sydney, Canada, Vienna and the USA. Only one nephew remains in Iraq. 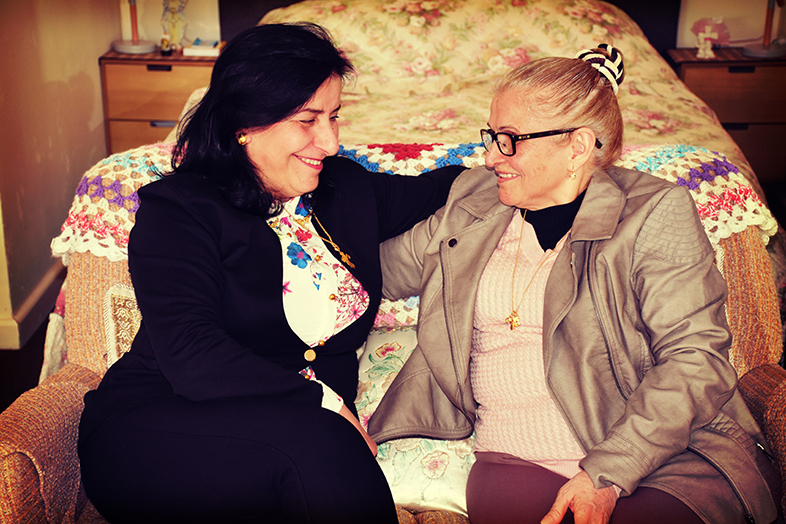 Fortunately, now that they will continue to be neighbours, along with the other 13 older refugees from Syria and Iraq who will be staying at the Eltham Village, they won’t feel quite so alone. And the warm welcome they have received from local residents has helped to further soften the pain of starting afresh. Khani agrees, ‘I’m so happy because I feel I am in my country with my friends, my neighbours and my people. Every day is beautiful! *Hanna and Khani shared their story with the help of an interpreter.